Finally cleared off here this afternoon. Despite the cold wind, I decided to have a go at the sunspot. I managed 1000 frames. Kinda tough achieving focus when you can't see the laptop screen. I had a towel over my head and the screen but the wind was flapping things around annoyingly. The orange color comes from the Thousand Oaks film on the ES filter. Baader would be better, but my Baader is too small for this scope. SV102T, AVX, ASI174MC, best 10% stacked via Autostakkert!, wavelets via Registax, PS for cropping. Some stacking artifacts in there, especially noticeably around the limb of the solar disk. Not sure how to mitigate that. Seems to be a problem I have with solar stacking. terrynak, kingclinton, 10538 and 10 others like this. I was hoping someone would post a pic of it today; was wondering where it was on the disc in relation to yesterday. I really like the color you get with the Thousand Oaks filter too! Wonderful image Bryan! 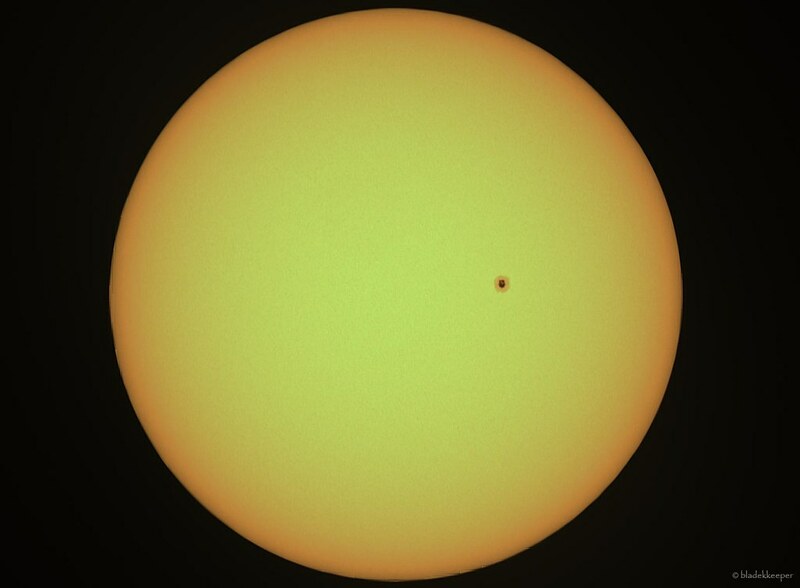 Cloudy today, otherwise I would take a look at the sunspot. Supposed to be clear this evening and the wind has abated some. Of course, now we have loads of horsetail clouds filling up the sky. They don't even show up on radar imagery. I am still set up in the backyard. Hoping to capture some lunar frames this evening. Guess I'll sit and watch Game of Thrones and hope the clouds shove off elsewhere. The rest of the week appears to be cloudy and full of rain. The sod already sounds like a bowl of Rice Krispies. terrynak and TheFatKitty like this. Hope you got some imaging done tonight Bryan! No joy here. Thick bars of clouds are squatting in place. I packed it up and came back inside. No Tales from the Trash Heap tonight. Thanks Bryan! Actually the haziness is getting worse, so I'm not going to set up after all, even though the moon is blazing brightly. Glad I got the racking issue on my Meade 5" fixed - a yellow buffer strip solved the problem. As soon as I set up outside and did the GOTO alignment, huge billowy clouds from the coast started moving in. So I had to pack it in, without getting a single object (except for the two alignment stars). Totally overcast now. Also found out I need to remove the dovetail bar still attached to the OTA of the 4" scope. Can't move the scope higher up to get the focuser to eye-level from my folding seat. Currently sits between the two tube rings on an 8" bar. Otherwise, overhead targets need to be observed from a crouching position on the ground. Just went out and checked my sky. It has remained poor, so that pleases me that I wasn't being premature. Not fun when you pop out just before bedtime and see what you've missed. I did catch a Great Horned Owl hooting from my roof top. Yeah, my two 1200mm focal length fracs require some hunkering when observing overhead targets. Not usually too much of a problem unless I've had a large milkshake with my supper (I'm a sucker for the Chick-fil-A peach shakes in the summertime). Those get a little difficult to bend over.